As reported several times before, the sidebar in the wiki is empty for everyone who doesn't have an account here or is not logged in. It'd be nice if the wiki had a place for wiki discussions (besides the front page I mean). Also a list or widget on the front page to display recent articles/show off current or planned events (declarations of war, planned battles, new nations, etc). — Juinn ???? Every page has its own dedicated discussion page. *some people on the server want to have competitions/tournaments i was wondering if we should make a page for them or include them in another section like battles? thoughts opinions? 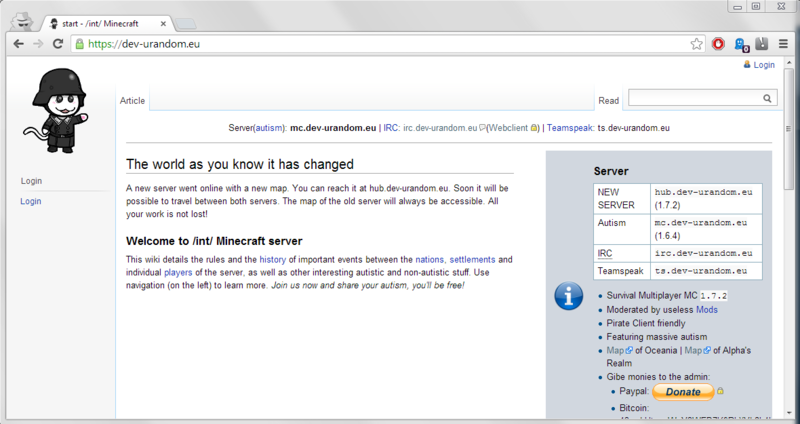 would help if you changed that on the start page seeing as the current IP will be deleted.